Your website is fabulous. Fast and easy! I love the hair received last week. Keep me coming-Thanks a million! they are absolutley awesome ! i wouldnt want to get them anywhere else ! I repeat my same previous comment... Excellent quality hair! Thanks much! I wish you can give half star ratings but I can't. My real true rating would be 3.5 oppose to the whole 4 stars. Ill begin by saying I got the rose to purple hair extensions and they are indeed beautiful! And they stood true to their saying it did only take 1 week to arrive, from china to california so that is absolutely splended! So here's the problem I encountered with these extensions. But before I continue I wanted to state that I am a light skinned hispanic with natural black thick hair. So I ordered two of these extensions bc many other reviewers suggested to get 2 of them if u have thick hair.Here's the thing.... these extensions are both thick and thin.. ur probably wondering how could that be? Ok so here's the problem I thought these extensions would have been one piece of continual hair that is just dyed or fabricated to have the ombre effect. It isn't like that. Its actually two pieces of hair of two different colors stacked on top of each other. With that being said the extensions are very very thick at the top (bc its layered w/the 2 pieces of hair) and then very thin at the bottom (bc its only one piece of hair. When I wear both extensions my head is massively heavy and i have massive drag queen volume! So for me personally the 2nd extension is unnecessary ill probably never wear both at the same time unless im going to west hollywood to party w/my drag queens lol! (Which is highly unlikely)Next problem! Straightened or curled?let me tell u about this epic fail. Im not into curling my hair bc my hair is naturally curly and I actually usually rock a straight hair look everyday unless I feel like having my curly hair. Now this is how I encountered my next problem w/these extensins. My hair is around my mid back where my bra strap is and with these extensions curled (the way they arrived) u can't even see them! They are the same length as my hair! This defeated the purpose of these extensions if they aren't even going to show >_&lt; wah!So I read u can straightened these things so since I have 2 extensions I figure why not! I have a chi hair straightener and I was scared to fry the extensions so I had it on 180 (lowest setting) and did quick passes on it until its straight and idk if any other ppl have this problem w/the chi it might just be me and the way I hold it or something but before I knew it I changed the dial and had been straightening my extension on heat 410 (highest) so its safe to say u can't melt these things bc mine didn't! Lmao not that I was trying to but it all just happened by accident. In any given case once I straighted the extension and straightened my own hair (bc it was in its wavy/curly form) I put the extension in only to find that now my extension is ridiculously long! -_- it was barely gracing my waist line and while I loved the long hair effect there's no way I would blend my hair to make it look like it was my hair bc of the massive length difference between my hair and the extension! There is a simple solution to this problem. Cut the straightened extension but I don't want to do that bc they are so pretty and majestic. So for now im just stumped at what on earth I should do. The only thing I haven't tried yet is actually curling my hair w/semi tight curls to see if then at that point my hair would be short enough to let the pink/purple hair show threw. Ill be posting photos soon bc photos are always helpful and they would've probably helped me steer clear of this purchase. Not that these were horrible, they just didn't work out for me. Ill stick to full on wigs. Hope this lengthy review helped! The swatch was soft and perfectly matched my hair color. I look forward to buying a set of 20&quot; extensions! 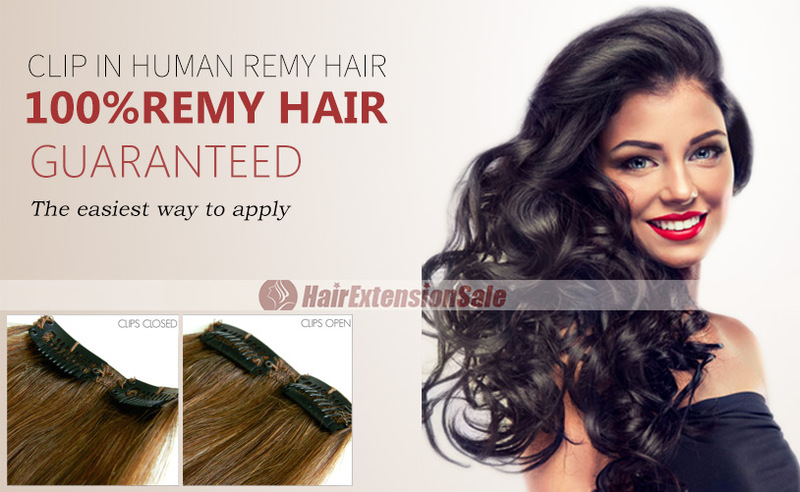 I think these extensions are nice and they fulfill perfectly the function that I had envisioned for them. These are very long and quite full. 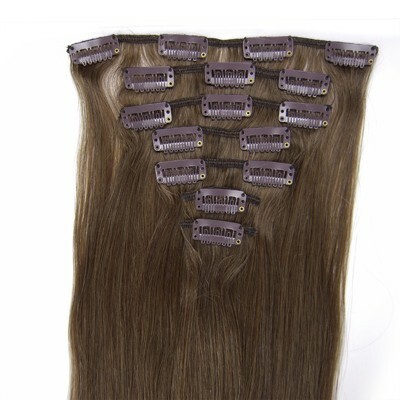 I already happen to have really long hair (going down to my waist which is even a bit longer than the extensions, but, again, it depends on where on your head you choose to clip them in - i.e. higher and closer to the crown or lower), I wanted to have thicker hair, particularly for braided hairdos and let me tell you with these extensions my hair is humongous. I am even a bit worried that doing a single braid with these extensions on makes my hair look a bit too full, thus making it look somewhat fake. However, the hair itself isn't bad. It's obviously not real hair, but it blends in decently with my own, even if it has a definite tint of auburn (which my own hair doesn't). It's not overly shiny (as in fake shiny), but also not the silkiest hair either which makes it tangle a bit, but so far I've been able to deal with that very well with a bit of patience.<br />I find that if your hair is already that long and you're simply wearing your hair hanging loose over your back, although the extensions blend well, they don't really add a lot (maybe a change of 5% in the direction of increased volume as opposed to an 80% increase in volume appearance when braided). That's totally fine with me as I ordered these only for occasional wear and the clips aren't really comfortable enough to wear all the time imo. Also, sometimes I find that I have to try several times before a clip closes, based on the position and the curvature of my head, but with the other 4 clips securely in place it would probably still not slide. I haven't noticed any real shedding, although I have brushed through these. I'll see how well they'll hold up to washing.<br /><br />All in all, i am really happy with these for the price. They give great volume to my already long hair and when braided in the hair does not have any kind of conspicuous shine to give it off as fake. Of course, most ppl would not have such a thick braid naturally, but then again I do have one friend who comes terribly close to that w/o any extensions. I'd enjoy a slightly smaller set of say 2 3-clip pieces in a lighter color that I could use alternatively to these to achieve highlights (with my own darker hair sandwiched in between). I haven't tried it with this hairpiece in a lighter shade (the dark brown matches my own shade pretty well), but I think there's probably too much hair in it to result in believable highlights.